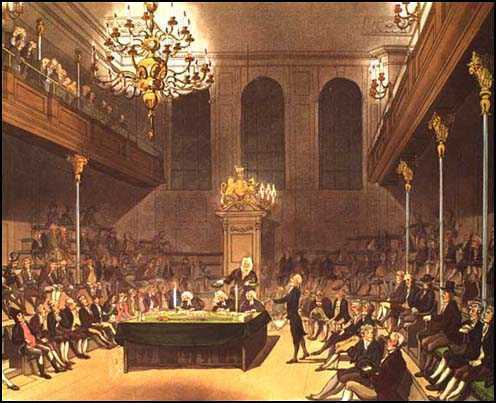 The Currency Act was passed by the British Parliament on September 1, 1764 as part of Prime Minister George Grenville's plan, along with the Sugar Act and the Stamp Act, to reduce the British national debt, pay the costs of having 10,000 troops stationed in the American colonies and rev up the British economy. 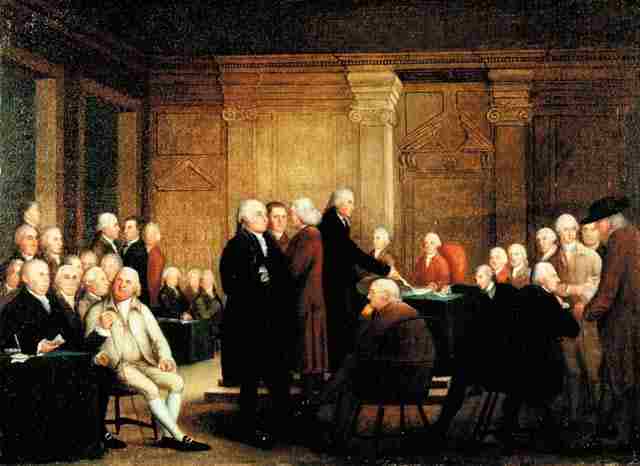 These acts caused the American colonists to ban together to protest "taxation without representation" and the violating of their rights as British citizens, ultimately culminating in the American Revolutionary War. You can read more about the Currency Act below and read the actual Currency Act text as well. The time immediately after the French and Indian War marked a profound shift in the relationship between Great Britain and her American colonies. The British national debt soared during the war, which was fought to keep the French and Indians out of British ruled territory in the colonies. After the war, 10,000 troops were still stationed in America in order to provide further protection if the need would arise. The newly elected Prime Minister, George Grenville, sought to reduce the national debt and pay for the expenses of the troops still in America by passing a series of acts designed to increase revenue, get greater control over colonial trade, reduce smuggling and reduce the debt. The Sugar Act was passed in order to reduce smuggling of molasses and sugar products, one of the most widely traded products at the time, and to create revenue from the collection of taxes on these and other items. You can learn more about the Sugar Act here. The Currency Act was passed in an effort to control the colonies' printing and usage of paper money, which was causing trouble due to inflation and a confusing system of various valuations and issues from differing colonies. Finally, the Stamp Act was passed in order to provide an additional source of revenue by placing a small tax on all paper documents such as licenses, contracts, newspapers, pamphlets, etc. The outcry against these acts caused great surprise to Parliament. The colonists rose up with a united voice challenging Parliament's constitutional right to tax them at all. Indeed the colonists' anger had been growing since the passage of the Molasses Act and the Proclamation of 1763, but with the passage of the Currency Act, they began to organize and protest against Parliament for abusing their rights as British citizens, ultimately leading to the American Revolution. The American colonies were quite prosperous due to their agricultural commodities, but after the French and Indian War, the colonies suffered from an economic downturn, mostly because a large part of their economy for the previous decade consisted of supplying British troops with food and supplies. 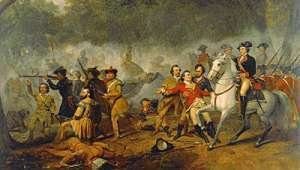 The French and Indian War had gone on for nearly a decade, from 1754 to 1763. Once that war was over, colonial merchants did not have enough buyers for their products and the entire market slumped. In addition to this, the colonies suffered from a lack of hard currency, meaning physical gold and silver coins, because of the huge trade deficit existing between them and Great Britain. Any money earned in the colonies from trade with other nations tended to be sucked back to Great Britain, from which the colonists bought most of their manufactured items. Raw materials were shipped from the colonies back to England and manufactured items were then purchased with the money, but manufactured items cost more than raw materials. The resulting trade imbalance caused the colonies to suffer a chronic shortage of funds. In an effort to remedy this problem, the colonists came up with other systems of exchange, including land banks, which issued paper money in exchange for land as collateral, bills of credit, which were issued by colonial legislatures and backed by tax revenue, foreign currencies including Dutch ducats, Spanish doubloons and French crowns and even bartering with agricultural goods such as furs, corn and tobacco. Paper money that was issued by the colonial legislatures was of particular concern. Some paper could only be used for public debts, such as paying for military supplies or taxes. Some could be used only for private debts, such as for purchases from a merchant. Some had various expiration dates, meaning they had to be returned and traded back in to the government by a certain date. This paper currency held differing values depending on where it was issued and where someone was trying to use it. A bill issued from Pennsylvania might be worth something in Pennsylvania and nothing in Massachusetts. All of these variations created a confusing system of financial transactions that caused many people not to trust using them because they were unsure of what the currencies were actually worth. Especially in England, these colonial currencies were not trusted. British manufacturers did not like receiving payment for their goods in colonial paper currency because they were never sure what they were worth, if they were worth anything at all. In 1751, Parliament tried to remedy this problem by passing the Currency Act of 1751. This Act forbade the New England colonies from issuing paper money, in an effort to reduce the inflation caused by the devaluation of these currencies. The Act allowed the printing of paper currency only in certain circumstances. It allowed any paper money already issued to be used for the paying of public debts, such as taxes, only and not for private debts, such as to merchants. In the end, this Act made the financial situation in the colonies even worse because it removed one of the primary mediums of exchange, which, no matter how unstable, was widely used. Colonists had even less to buy goods and services from other colonists and from British manufacturers as well. The problem only made the current economic troubles even worse. You can read the text of the Currency Act of 1751 here. The colonists looked at paper money issued by their legislatures, however, in a very different light than the way Parliament looked at it. The colonists saw having the government in control of issuing money as a plus because it kept the creation of money out of the hand of banks. In England, the way the government raised funds was to borrow huge sums from the banks and pay it back with interest. Of course this pleased the banks, but it also created a greater tax burden on the citizens who had to pay back, through taxes, not only the borrowed money, but also the interest. By removing the banks from the equation and having the government directly in control of creating money, the taxpayers' burden was greatly reduced. This is the very argument that Benjamin Franklin made to the British Board of Trade in 1763 while explaining to them the benefits of colonial paper money. 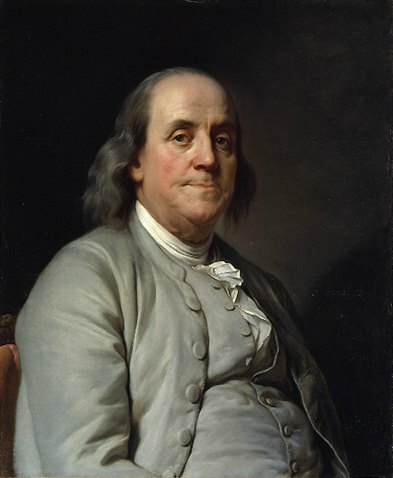 Franklin was Pennsylvania's representative to the Crown at that time. The colonists generally viewed the printing of their own money as a positive, in spite of the problems, because it left the bankers out of the mix. Of course, the British bankers did not like this, preferring that the colonial legislatures would borrow huge sums from them and pay it back with interest. The bankers and their allies in Parliament successfully passed the Currency Act of 1764 to remedy the problem. This was done shortly after Franklin's explanation of colonial currency to the Board of Trade and some blame the passage of the Currency Act on his speech to them. In 1764, Parliament passed a new version of the Currency Act, which contained two basic provisions. It prohibited all the colonies from issuing any new bills and making them legal tender for the paying of any debts whatsoever. Secondly, it forbade the use of any already issued bills beyond their original expiration date. At the time, government issued money had a "call in" date, meaning the bill had to be returned to the government by a certain date. This helped the money keep its value because, when it was turned in, the value would be reimbursed to the bearer in some other form of currency. Parliament was trying to protect the value of the already existing currency and eventually remove it altogether from the market as it was retired. Parliament was also trying to force all transactions to be made using the British pound sterling, instead of the various colonial issues with their confusing values and purposes, in order to stabilize the economy and restore the trust of British merchants and shippers in their trade relations with the colonies. You can read the entire Currency Act of 1764 text here. The Currency Act created even more trouble for the colonial economy by reducing the average person's ability to perform quick and easy trading of goods and services. Even though the various currencies issued by various colonies had different and unpredictable worths depending on location, the colonists were used to using them as an efficient means of trade. The sudden removal of large quantities of bills, many dating from the French and Indian War period, had a devastating effect on the economy. It gave them less to trade with amongst one another, with foreign merchants and with British merchants, causing even more trouble to an already ailing economy both in the colonies and back in Britain. 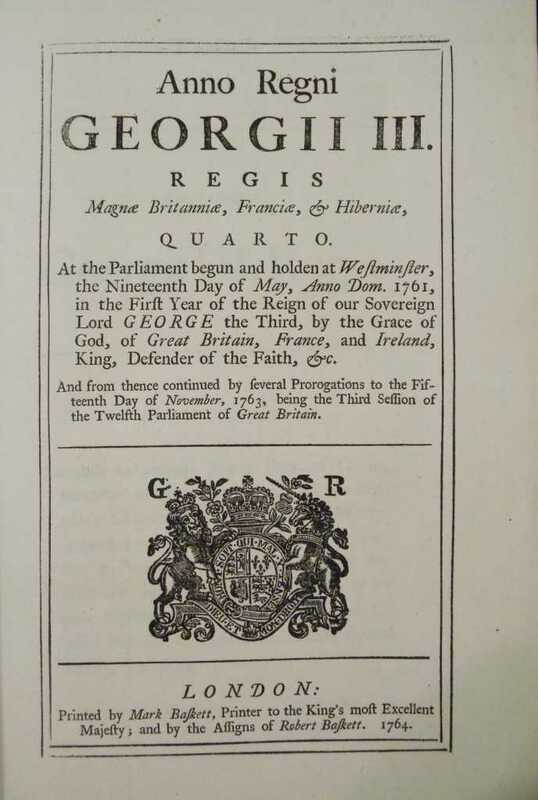 The several Acts of 4 George III. ch. 15, and ch. 34. 5 George III. ch. 25. 6 George III. ch. 52. 7 George III. ch. 41, and ch. 46. 8 George III. ch. 22, which impose duties for the purpose of raising a revenue in America, extend the powers of the Admiralty Courts beyond their ancient limits, deprive the American subject of trial by jury, authorize the Judge's certificate to indemnify the prosecutor from damages, that he might otherwise be liable to, requiring oppressive security from a claimant of ships and goods seized, before he shall be allowed to defend his property, and are subversive of American rights." Notice the italicized part that reads "4 George III. ch. 15." This is the official reference in Parliamentary documents that refers to the Currency Act. It means chapter fifteen of the acts passed by Parliament in the 4th year of the reign of King George III. The Currency Act caused such resentment in the Americans toward Parliament and the Crown that the First Continental Congress brought it up ten years later, calling it "subversive of American rights." Parliament amended the Currency Act of 1764 in 1773 to address some of the concerns of the colonists and many of these issues were resolved with that amendment. However, the mere fact of the amendment still intimated that Parliament had control over the colonial banking system and this was not acceptable to the colonists. When paired together with the consequences of the Sugar Act, which increased taxes, removed the right of trial by jury in certain cases and generally damaged the colonial economy, along with the Stamp Act, which increased taxes as well, the Currency Act, which was intended to shore up and stabilize the colonial economy and increase the British tax revenue, only caused deep seated resentment that lasted until and greatly contributed to the American Revolution. To reduce confusion in the financial markets created by the existence of many different printings of colonial paper money, each with different values, acceptable uses and retirement dates. The currencies had fluctuating valuations and were not backed with hard money. British manufacturers had great mistrust in the currencies and did not like to receive them as payment for goods because they were often not as valuable as the goods for which they were paid as debt. To stabilize the colonial economy and boost the British economy, both of which were in a post war slump after the end of the French and Indian War. To force colonial legislatures to borrow from British banks in order to finance their operations. This would cause British banks to earn more money from interest payments and increase British tax revenue. Prevented all American colonial legislatures from issuing any more bills to be used as legal tender for the payments of debts, public or private. Prevented colonial legislatures from extending the retirement dates of any already issued bills in order to help them retain their value and remove them from the market altogether. Caused an immediate restriction in both the colonial and British economies by removing one of the primary mediums of exchange. Reduced the colonists' ability to trade amongst themselves, with foreign powers or with Great Britain by removing money from the market. Caused colonists to be unable to purchase manufactured goods from Great Britain. Alarmed the colonists by taking away their right to regulate their own financial affairs, putting Parliament in control of their banking system. The colonists viewed this as an unconstitutional usurpation of their natural right to govern themselves instigating, anger toward Parliament that resulted in the American Revolution. This article is one of a chronological series of articles that explain the causes of the Revolutionary War. Follow the links to read about the preceding and subsequent events leading up to the American Revolution. The series is not complete yet but more articles will be posted soon.